In this month’s column we have two arts organizations taking on Slavic traditions and history. Pax Christi Chorale presents “Slavic Devotion” and Vesnivka Choir leads a commemorative concert for the 85th anniversary of the Holodomor. Inseparable from Slavic history is the relationship of Orthodox Christianity in the region. The traditions of Slavic Orthodoxy are distinct from those of Western Europe, with the sphere of influence having been Constantinople rather than Rome. In the deep ritual and spirituality of the Orthodoxy, we find many of the great Eastern European composers. Two are featured by artistic director David Bowser: Stravinsky’s A Symphony of Psalms; and Rachmaninoff’s Vocalise and All Night Vigil. Gennadi made a name for herself as the lead in the Tapestry Opera production of the new opera Oksana G. in May 2017. A Russian language and literature specialist, Gennadi’s thorough comfort in the Russian and Ukrainian languages and tradition will be well-suited to this concert. For Bowser, this is a chance to work together again” “We have been looking for a project and her expertise in Russian and Ukrainian repertoire and language gave us an opportunity to highlight the great works from this part of the world,” he says. Rachmaninoff’s Vocalise contains no actual words. The ethereal sounds on beautiful open vowels allow Gennadi to evoke, inspire and create a narrative of her own making through the music. Unlike instrumental music, which exists without consonants and vowels, the physical function of singing is usually a carefully articulated rhythmic roadmap of deftly shaped words. Allowing yourself the indulgence of experiencing gorgeous vocal lines free of the constraints of words has a universality of the effect that may surprise even the most experienced choral listener. Paired with the stunning All-Night Vigil, listeners will find themselves transfixed. “These are extraordinary works for the human voice,” says Bowser. “The synchronized vibration of 100 voices makes this experience all the more satisfying. October 17 at 7:30pm and October 28 at 3pm. Pax Christi Chorale performs Slavic Devotion. With guest soprano Natalya Gennadi. Grace Church on-the-Hill. Under the iron fist of Stalin’s Soviet Russia, millions of Ukrainians died from government-sponsored famine, neglect and isolation during peacetime. Restricting people from escaping famine-stricken communities, imposing total government control of food production, confiscating food and restricting community access to it, the Soviet government created the conditions for famine and millions died. Writing together, artistic director Halyna Kondracki and executive member Lesia Komorowsky responded to a few of my inquiries about the commemorative concert. Chorister Valentina Kuryliw also provided comments. Their knowledge and gracious sharing of history show a connection and thoughtfulness bridging the important acts of memory, religion and music. It is no accident that Vesnivka is celebrating its 53rd year of music making. For this commemoration, Kondracki has programmed an entirely Ukrainian concert. Many Ukrainian composers have written works to commemorate the Holodomor. Evhen Stankovych’s Requiem will be performed as well as Hanna Havryletz’s My God, why have You abandoned me? The late Ukrainian-Canadian composer Zenoby Lawryshyn’s Tryptych: In Memoriam to the Victims of Holodomor will also be performed. Lawryshyn was a dear friend of the choir and created many works for Vesnivka over the years. And treasured local Ukrainian-Canadian composer Larysa Kuzmenko’s Voice of Hope will be performed with soprano solo by Antonina Ermolenko accompanied by the Gryphon Trio. Recognizing the Slavic Orthodoxy is inseparable from the Ukrainian-Canadian experience. Sacred music composer Roman Hurko is of Ukrainian Canadian descent. Educated at the University of Toronto and Yale University, his speciality has been composing for the Byzantine Rite, still the major form used by Slavic Orthodoxy. The historical rootedness of his composing was brought forth in his major work Requiem/Panachyda, written to commemorate another Ukrainian historical moment – the nuclear disaster at Chernobyl. The choirs will sing Eternal Memory, an excerpt from the Requiem. The church continues to be an important part of the Ukrainian-Canadian tradition and Vesnivka continues that work. And never far form their work is the Orthodox Rite. At their religious home of St Nicholas Ukrainian Catholic Church, Vesnivka bring forth all the history and memory of what it means to be Ukrainian and Canadian. On October 21, 2018, Vesnivka will join other dignitaries and guests at the unveiling of the Toronto memorial to the victims of the Holodomor. Led by the Toronto Ukrainian Association, the new memorial will stand just north of the Princess Gates to Exhibition Place. October 28, 5pm. Vesnivka and the Toronto Ukrainian Male Chamber Choir present “Commemorating Holodomor.” With special guests the Elmer Iseler Singers, the Gryphon Trio and soprano Antonina Ermolenko. Runnymede United Church, Toronto. OCT 10, 7:30PM: Chorus Niagara presents Brahms’ great work: Ein Deutsches Requiem (A German Requiem). With the Avanti Orchestra and soloists. Chorus Niagara, under Bob Cooper, is a fantastic ensemble bringing fine choral music to the Niagara region. FirstOntario Performing Arts Centre, St Catharines. OCT 27, 7:30PM: The Orpheus Choir of Toronto performs the music to the 1924 silent film Peter Pan. This is a new film undertaking for the choir and will prove to be an exciting addition to the oft-performed Phantom of the Opera. Eglinton St. Georges United Church. NOV 4, 4PM: The Amadeus Choir presents “The Great War: A Commemoration.” Featuring Gabriel Faure’s Requiem and joined by guests, the Eglinton St. George’s Choir and soloists. This is an earlier option for those looking to catch commemorations for Remembrance Day. Eglinton St .George’s United Church. Follow Brian on Twitter @bfchang Send info/media/tips to choralscene@thewholenote.com. First Step? Start a Choir. That’s What Annegret Did. All it takes is one person with initiative and a few friends to start a choir.” The speaker is Lucas Harris, current artistic director of the Toronto Chamber Choir (TCC). The person he is talking about is Annegret Wright whose initiative it was, five decades ago, to get the TCC started. Not many arts organizations can sustain themselves for decades, and 50 years is a remarkable feat, requiring not just loyalty to an organization’s founder but also the ability to change. Harris is now at the helm, taking the TCC into its golden jubilee, but “[past conductors],Elizabeth Anderson, Mark Vuorinen and David Fallis are all heroes of mine,” says Harris, “and I’m honoured to feature them in this concert.” Together on September 29, the combined forces of these impressive artistic leaders should make the start of the TCC’s 50th anniversary season a celebration to remember. Harris reaches me by email, providing a glimpse into how the choir retains its awareness of its history. The choir’s archivist, Sharon Adamson, has kept meticulous records, he explains. These include “the choir’s complete membership history, every concert performed, every venue rented, every work sung, every soloist/section lead/instrumentalist hired over the choir’s entire history.” He gives me statistics that can be drawn from the archival work: 177 concert programs, 1500 works performed, 418 members across the decades, 357 instrumentalists hired, and five artistic directors. Impressive. The work for this concert began last season, and the programming reflects Harris’s awareness of its past. He has programmed “hits by the choir’s all-time favorite composers, including Monteverdi, Purcell, Bach, Britten and more,” he says. There’s even a chorus from Schütz’s Musikalische Exequien (Funeral Music) that was in the very first TCC concert. Other homages include Fallis leading Healey Willan’s three Marian motets. Elizabeth Anderson, a frequent guest conductor of the choir, began rehearsing the concert in March. Harris describes her as “a seasoned church musician with amazing ears (and perfect pitch) and is brilliant at firing up the group to learn music quickly.” As they head back to rehearsals, they’ve already got a head start. Harris has further thoughts on the longevity of the choir and what it has to offer. “I think that the most important factor keeping our music-making fresh is the enormous amount of repertoire there is to explore … even just within Baroque and Renaissance music,” says Harris. Much can be said about the bridging of the old and the new in creative ways. Under Harris’s leadership, the ensemble is embracing some innovative programming. With a modernization of the “Kaffeemusik” format, the choir’s Sunday afternoon performances have taken on a new life with multimedia, narrators and actors. The goal is “to explore something broader than just the music … to add historical and/or social context to the music,” shares Harris. He’s excited about previous forays into Eastern European and Scandinavian music, and a special focus on female composers prior to Clara Schumann. “We’re also partnering with more diverse artists in order to explore beyond our usual repertoire,” he continues. The list of upcoming guests is impressive and exciting. The Nathaniel Dett Chorale, soprano/conductor Teri Dunn, tenor Charles Daniels, musicologists, and even First Nations language specialists are part of the plans. Harris continues to look both to the old and the new in programming. “There is still so much more music out there to explore … I’m keenly aware of this every time I visit a good music library and just pull volumes of music off the shelves. Even after two decades of specializing in early music, I humbly realize that I have only experienced the tip of an iceberg,” he says. Fifty years ago, all it took was a few friends around Annegret Wright to start a new choir. 177 concert programs and 1500 works performed later, the Toronto Chamber Choir begins its 50th anniversary season in fine style and esteemed company – with the prospect of much more ahead. The Toronto Chamber Choir presents “Music & Friendship” September 29 at 8pm at Trinity-St. Paul’s Centre, Toronto. See more about upcoming performances of the Toronto Chamber Choir at torontochamberchoir.ca. The Toronto Symphony Orchestra opens its season with a rarely heard choral presentation of Fantasy on Shakespeare’s The Tempest from Lélio, or The Return to Life by Hector Berlioz. The Toronto Mendelssohn Choir joins the TSO under interim artistic director Sir Andrew Davis. September 20 and 22 at 8pm; September 21 at 7:30pm. Roy Thomson Hall, Toronto. Casual – Choir! Choir! Choir! The month of May is one of fully ripened choral fruit. At the end of the season for many choirs, these are the signature concerts for many ensembles and in some cases, farewells. I’ve provided some in-depth interviews and insights into a handful of concerts. Check out the Choral Canary Pages and learn about choirs in your area – and check out the listings for a more extensive list of concerts this month. The Tallis Choir Celebrates 40 years: Rise Up my Love! The Tallis Choir concludes their 40th anniversary season. Artistic director Peter Mahon spoke to The WholeNote about what to expect: “As we wrap up our 40th anniversary season, we commemorate the 50th anniversary of the death of Healey Willan and we offer a belated salute to our nation at the tail end of the 150th anniversary of Confederation with music by Canadian composers including Stephanie Martin, Eleanor Daley and Matthew Larkin” (all of whom reside in Toronto, as Mahon points out). “Most church singers in English Canada can name at least one piece by Healey,” says Mahon. “A good majority of them would also say that they can probably sing Rise Up My Love from memory. Such is the universal appeal of Willan’s music. For the most part, he wrote miniature gems, designed for the liturgy of the Church of St. Mary Magdalene, but choirs across the country and beyond sing them regularly… Speaking personally, I grew up listening to Willan’s music at St. Mary Magdalene, so it is in my blood.” Willan’s music anchors this all-Canadian presentation of music for Tallis’ 40th anniversary. May 12, 7:30pm. The Tallis Choir presents “Milestones.” St. Patrick’s Church, Toronto. Schola Magdalena: Votes for Women! While we have much to appreciate in universal suffrage in our contemporary Canada, we would do well to remember that it wasn’t always this way. Stephanie Martin brings history into focus with her thoughtful approach to composition and music. May 23, 8:15pm. Schola Magdalena presents “Celebrating 100 Years of Votes for Women in Canada.” Church of St. Mary Magdalene, Toronto. For many newcomers to Canada, with family, children, partners, and friends far away, love can feel distant – strong, but distant, explains Jacinto Salcedo, coordinator of the Cantemos Latin Ensemble speaking to The WholeNote about the words he wrote in the poem: La Rosa de los Vientos (The Wind Rose). “This is a recurrent theme for immigrants. Often, families are split, but you still love them, care for them, and want the best for them,” he shares. “It is nostalgic and touching.” For the tenth anniversary of the ensemble, the poem has been set to music by César Alejandro Carrillo, a very well-known Venezuelan choral composer and conductor. Carillo is especially known for his work with the Orfeón Universitario of the Central University of Venezuela. The Upper Canada Choristers, under Laurie Evan Fraser, have a big offering with their “Magic of Music” concert. In addition to Cantemos, guest baritone Bradley Christensen and the Junior and Chamber Choirs of Allenby Public School will join the performance. Christensen will perform Vaughan Williams’ Five Mystical Songs along with the choir. En masse, the choirs will perform Rutter’s The Music’s Always There With You. May 11, 8pm. The Upper Canada Choristers and Cantemos Latin Ensemble present “The Magic of Music.” Grace Church on-the-Hill, Toronto. There’s an astounding lineup. Part of the festival I’m flagging: artists FreePlay Duo (which is Sankaran and Bell); hugely popular all-male Rockapella; Retrocity, a local 80s group; an all-female concert featuring the Penthelia Singers and Girl Pow-R with others; and Resound, a totally unbelievable gospel trio who will drop your jaw and melt your heart. For new attendees, Sankaran has some tips. “Take in one of the weekend shows,” she says. “It will give you a chance to experience a workshop or two, go to the outdoor free stage, drink in some of the a cappella artists, and then go to an evening show.” In one concert, three groups are celebrating their 20th anniversaries: Retrocity, the Toronto Northern Lights and Cadence. It’s a great introduction to the “spectrum” of a cappella as Sankaran describes it, including barbershop, jazz and contemporary. SING! The Toronto Vocal Arts Festival offers big weekend concerts, a free outdoor stage, and intimate performances in small venues like the Jason George Pub and the Little Trinity Church. There’s a huge breadth of performers representing diverse musical styles and that is a direct reflection of the energy and connections that Sankaran and Bell bring to the table. Local sacred traditions are reflected with “SING! Crossroads,” which features the Ruach Singers and Six 13, both Jewish a cappella worship groups. “SING! Celebrates Gospel” brings in the Christian tradition rooted in Black music of North America. And the multidisciplinary aspect of the festival is reflected with “Art Battle”! Make sure to check out ten days of empowering a cappella music. SING! The Toronto Vocal Arts Festival runs from May 23 to June 3 in a variety of venues, mostly centred around the Distillery District, Toronto. Check out www.singtoronto.com for all the offerings. Last month, I wrongly reported that Hilary Apfelstadt’s final concert with the Exultate Chamber Singers was at their April 6 concert. There is one remaining program in the season, however: “We Sing and Connect,” which takes place on Friday May 25 and Saturday May 26. May 25 and May 26, 8pm. Exultate Chamber Singers presents “We Sing and Connect.” With special guests the Miles Nadal Jewish Community Centre Adult Choir (May 26 only). St. Thomas’s Anglican Church, Toronto. Emotion is at the core of every musical performance and storytelling is at the heart of emotion. Sometimes the stories can be esoteric, sometimes they are obvious, sometimes they challenge us to find them. There is an extra dimension that conductors put into their concerts when programming songs that tell a story to evoke certain feelings. Take in a well-constructed choral concert this month and see the part that musical storytelling plays. I’ve highlighted a few below. “Music has a way of softening the edges around a message, of getting at its true emotional core, and of transmitting that to a broad range of people,” says Annabelle Chvostek, JUNO-nominated singer-songwriter and artist-in-residence for Echo Women’s Choir. She continues: “Having music carry ideas can make things feel less preachy or didactic. It’s just giving it from the heart.” Chvostek is answering some of my questions by email. I’ve asked her about her experiences creating and adapting her solo music for Echo Women’s Choir. The story she’s telling here is one that is deeply personal for her. Her partner is a former refugee and Chvostek is sharing a story of acceptance, belonging and open arms. “Observing the global refugee crisis of the last few years has been powerful. Some of the most moving news moments for me have been around [refugees], including watching Canadian families and communities respond to the crisis with openness and generosity,” she continues.“And frustratingly, some people respond with fear.” Echo is sharing this music to move beyond fear. Echo is unlike any other choir in the city that I’ve met. It is a gathering of female-identified voices rooted in a compassion and drive for social justice. Their concerts are community gatherings centred around music, much of which is uniquely arranged for Echo by Alan Gasser. Becca Whitla and Gasser are co-directors with Chvostek. They want you to think and be challenged by their music and storytelling. There is deep thoughtfulness behind the music they program and the issues they want you to confront. Dene singer Leela Gilday comes to Toronto as the choir’s special guest. Based out of Yellowknife, Gilday shares stories and describes herself as having “a sense of humour as well as a sense of social justice and an ironic appreciation of human folly.” Her music and stories will be welcomed by the choir. Echo Women’s Choir presents “I’ll be Your Refuge” with special guest Leela Gilday and co-directors Becca Whitla, Alan Gasser and Annabelle Chvostek, Sunday April 29 at 3pm, at Church of the Holy Trinity, Toronto. For the Oakham House Choir upcoming concert “Better is Peace than Always War,” artistic director Matthew Jaskiewicz has paired Karl Jenkins’ The Armed Man and Gabriel Fauré’s Requiem. Two distinct works, they are companion pieces in their ability to channel a message of peace in the form of a mass. The concert’s title comes from the opening words of the 12th and final movement of Jenkins’ piece. The Armed Man is popular amongst community choirs for its universal message of peace and its musical accessibility. The work includes poetry by Rudyard Kipling, Jonathan Swift and Sankichi Tōge, a Japanese survivor of the Hiroshima bombing by the USA. The hymn L’homme armé, for which the work is named, is based on an ancient tune. The hymn tells us “the armed man should be feared,” a warning against those who carry and use weapons. Paired with The Armed Man, Jaskiewicz has chosen the Fauré Requiem. A beloved staple of French music and the requiem canon, this is a mass for the dead. Put into the context of a call for peace, this requiem performance will not be used for actual commemoration. Audiences will instead be challenged to think about the areas of the world plagued by conflict at this very moment. And as we approach the centenary of the end of World War I, it serves to remind us of past conflicts as well. This concert commemorates the end of the First World War and is a collaboration with the European Union consulates in Toronto. Members of the armed forces from the Scottish Regiment and Haller’s Army (Blue Army) will be in attendance. 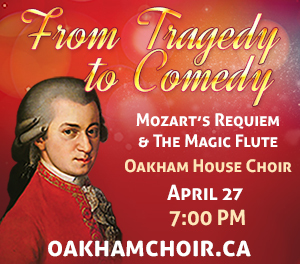 Oakham is also pleased to welcome the Novi Singers of Toronto to this performance. Oakham House Choir Society presents “Better is Peace Than Always War” on April 28, 7:30pm, at Metropolitan United Church, Toronto. Bowser is presenting the work in its original German because the “text is closer to today’s spoken German, and gives the music a more buoyant phrasing and crisper articulation. It should be underlined that neither Haydn nor van Swieten, who wrote both versions, spoke English with any fluency and the settings are clumsy,” he says. Many a chorister has frowned when confronted with the awkward English of “And to th’ ethereal vaults resound” or “achieved” in three syllables. The original German allows the choir to move beyond such awkwardness. Rossignol’s live visual accompaniment promises to give the concert a unique visual storytelling dimension. Pax Christi Chorale presents Die Schöpfung (The Creation) with the Toronto Mozart Players, Danika Lorèn (soprano), Charles Sy (tenor), Oliver Laquerre (bass-baritone), and live video performance by Sandy Rossignol on April 28 at 7:30pm, at Grace Church on-the-Hill, Toronto. Apr 6: Exultate Chamber Singers presents “We Sing and Play!” As noted in last month’s Choral Scene, Dr Hilary Apfelstadt is retiring from the University of Toronto and as artistic director of Exultate. She brings the Toronto Winds to her final concert with Exultate, which features the premiere of Resurgam by Canadian composer Matthew Emery, the choir’s composer-in-residence. Emery has blended Renaissance polyphony with contemporary compositional techniques to create a work for an interesting pairing: voice and small wind ensemble. St. Thomas’s Anglican Church, Toronto. Apr 28 and 29: DaCapo Chamber Choir and the Orpheus Choir of Toronto present This Thirsty Land. Joined by instrumentalists, the choirs present the local premiere of DaCapo artistic director Leonard Enns’ work This Thirsty Land, recently commissioned and premiered by the University of Guelph. Other smaller works include Toronto-based composer Hussein Janmohamed’s Sun on Water and Norwegian Trond Kverno’s Ave Maris Stella. April 28, 8pm at St. John’s Lutheran, Waterloo, and April 29, 3:30pm at St. Anne’s Anglican Church, Toronto. Apr 29: Amadeus Choir of Greater Toronto presents “I Saw Eternity.” Artistic director Lydia Adams conducts the choir’s final concert of the season featuring music by Eric Whitacre, Eleanor Daley, Hussein Janmohamed, Stephen Chatman and more. The inspiration for the concert comes from Henry Vaughan’s poem The World, which opens with the lines: “I saw eternity the other night.” Leonard Enns’ and Stephen Chatman’s settings of The World are presented along with other spacious works including Ola Gjeilo’s Serenity and Eric Whitacre’s Water Night. Eglinton St. George’s United Church, Toronto. May 5: Mississauga Festival Choirs present “Generations,” with the Mississauga Festival Choir, the Mississauga Festival Chamber Choir, their youth choir, Resonance, and their intergenerational choir Raising Voices. The signature work of the evening will be John Rutter’s Mass of the Children. Living Arts Centre, Mississauga. May 6: St. Anne’s Anglican Choir presents “A Hubert Parry Tribute.” The Junction Trio joins a larger orchestra and the St. Anne’s Choir under music director John-Luke Addison. The concert commemorates 100 years since the death of Sir Charles Hubert Hastings Parry. Royal music aficionados will know him for his coronation anthem I was Glad, which was written for the coronation of King Edward VII in 1902. The famous Anglican hymn Repton, a staple of congregations around the world was set to music by Parry. St. Anne’s Anglican Church, Toronto.